Tesla’s Model X is an astounding showcase of what cars will look like in the future. Lucky for us, it’s available today. Somehow, Tesla made a name for itself in an era when hybrid cars were having a hard time resonating, let alone all-electric vehicles (EV). The promise of an EV sedan coming from a company that just made an electric rich-guy sports car probably didn’t raise too many eyebrows at first. A few years later, hybrids are our racecars, and carmakers are “mobility companies.” Tesla is not only still around, it’s now the most valuable American car company. After the success of the Model S, Tesla’s first all-original vehicle, fans and critics alike were eager to see what the upstart startup had planned for its sophomore entry. That vehicle is the Model X, the all-electric long-range SUV. It won’t just change how you view electric cars, it’ll make you rethink cars altogether. The Tesla Model X P sits in the middle of Tesla’s soon-to-be three car lineup between the Model S sedan and the forthcoming Model 3, a more attainable compact four-door EV. Like the Model S, the Model X is built on Tesla’s platform that uses the floor to store the batteries and sports a motor at both ends. The front favors efficiency while the rear facilitates performance. Together, they give the Model X the equivalent of 762 horsepower, or 568 kW. The Model X won’t just change how you view electric cars, it’ll make you rethink cars altogether. Let’s start with the name. Model X P100D. The ‘P’ stands for performance, the ‘100’ is 100kWh battery size, and the ‘D’ means dual motor. The baseline Model X is the 75D, which starts at around $82,000 and nets you 237 miles of estimated range per charge. This is followed by the P90D, which offers 257 miles of range, and then the 100D, sans P, which offers 295. Go for full performance, and the range dips slightly to 289. Without options, the Model X P100D starts at $135,500. For our Tesla Model X review, we received a fully loaded model that topped out at $162,970 – a hefty chunk of change. You may have seen a Tesla or two around town and wondered what the big deal was. Sure, you get a sleek-looking car that’s emissions-free and gets over 200 miles of range. “BFD,” you might have thought to yourself, as you put Tesla owners in the same category as Android-hating iPhone lovers. As it turns out, starting from scratch let Tesla think differently about the electric car, and there are a ton of small surprises in the Model X. From the start, the Model X makes it apparent that the driving experience will be different. The odd-shaped SUV is a lot larger in person than you’d think. It looks low and long, like a wagon, and it’s tall up close. The lack of need for a traditional grill (no gas engine) means the front is stark, with a few channels for air and the headlights being the only standouts, apart from the emblem on its beak. The car’s key is shaped like the Model X and interfaces remotely with it when you press on it. It’s like having a Hot Wheels car that mirrors your real car. Tapping on the side of the key fob causes your real-life doors to open. We approached the Model X and it detected our proximity, and unfolded its mirrors, turned on lights, and presented the driver’s seat. Front and passenger doors? They open with a click. Rear liftgate? It opens and closes with a push of the mini-Tesla’s rump. We gave it a squeeze, and the impressive falcon doors crane opened out and upward. Give it three quick clicks on the top, and the Model X will fold itself back into car shape, too. The Model X can even detect how much space it has around it. At one point we eagerly tapped the key fob to make the doors open, and then panicked when we realized the doors were close to a wall. Tesla was one step ahead of us. The car sensed the narrow space it had to work with and bent the door at its crook to compensate. There are a multitude of sensors and cameras subtly integrated throughout the exterior, and they monitor for all sorts of hazards. Using the “follow” function on the smartphone app, the Model X can even creep out of a tight parking spot on its own if needed. The Model X has a few different configurations depending on how many people you care to carry. You can configure it with full three-seater row and another row in the rear, or you can have two captains’ chairs and keep the back open for storage. Our Model X was somewhere in the middle, with a third row and two-seat setup. The rear passenger seats fit a tall human just fine, and can be adjusted forward or back by either its occupant or done by the driver. The extra third row is functional, but tight, as one would expect. Fitting three people of any size would be a big ask, but it can accommodate one or two in a pinch. If the presentation doesn’t make you feel like you entered a spacefaring shuttlecraft of some kind, the interior certainly will. Our test car’s interior was swathed in crisp white coverings that complimented the black surfaces. The faux-leather-like upholstery is surprisingly supple, and very easy to clean (we were told), though the hard shiny black plastic that makes up the back of the seats scuffed with every pass of a sneaker. It’s a bummer to see that because we almost expected the touch points to be space shuttle tiles or T-1000 liquid metal. The centerpiece of the Model X cockpit is the 17-inch touchscreen that is flanked by the only two buttons on the dashboard: the hazard lights and the glove box release. This is the access port to all the car’s features, and the driver to control and configure the car to an incredible degree. When you first get in the car, you can enter your name and create what is essentially a user profile. It remembers all your settings, from seats, to mirrors, to even how far you like the doors to open. The Model X’s driving characteristics are also set on the touchscreen. If you’re looking for more “ludicrous” driving (and with this feature, you will), it will favor fastness over efficiency. The height of the car can also be set. You can program it to lower at a set speed if you’re looking to streamline on fast highway runs but don’t want to go through menus. When at a stop, you can open and close any of the doors from the pop-up menu that appears, or adjust the rear passenger seats to help someone get out from the back. There are a few that utilize the entirety of the screen space, though most do not. For example, a full-screen Google map powers the navigation. Other features include FM radio, media from external sources like your phone, and built-in streaming services like Slacker and TuneIn Radio. Other functions include a phone menu when paired, a web browser, and an always-on view from the backup camera. If you get the chance to sit in a Model X, one of the first things you should do is look straight up. Do it, and you’ll really notice the huge panoramic windshield that stretches from the hood and right over the two front seats. A gradual tint keeps this from being distracting while driving, but in the moments when you need to look up to see a traffic light or to enjoy the view, it is impressive. There’s no ‘On’ button, just a down-to-earth steering wheel that controls the Tesla and a standard throttle and brake pedals. Depending on your settings, the car can creep forward when you lift off the throttle (like a combustion-engined car with an automatic gearbox), or you can allow the four-wheel regenerative brakes to slow the car down and make up some of the charge you’ve been expending. It’s about as close to single-pedal driving as you can get in this EV. The stopping distance is long, and it doesn’t come to a full rest. The Model X is constructed a lot like other EVs today, with batteries making up the base and two motors driving each axle. This gives it a very low center of gravity. In practice, this means the heavy, 5,000 lb Model X doesn’t lumber around bends. For better and worse, we felt emboldened to take corners in the Tesla maybe faster than we should have, almost as if the architecture was daring us. The body has lean, but not too much roll, and the independent suspension, anti-roll bars, and auto-leveling structure do a smooth job of keeping the tall Tesla in check. It’s pretty satisfying that your SUV wields the power to leave any wannabe street racers in the dust. Like all EVs, torque can be delivered immediately from the motors, and with the aptly named ludicrous speed upgrade, the Model X is ready to roll down any avenue with haste. Its a great way to deplete your battery, but a simple flex of the foot will plant passengers into the backs of their seats as the Model X warps forward without any hint of slowing down. How fast, you ask? We’re talking 0 to 60 in 3.2 seconds, and that’s without engaging in the not-so-secret “ludicrous plus” mode. Yes, the crazy gets crazier. Accessible through a hidden menu filled with a bunch of fun Easter eggs, ludicrous plus mode pushes all the components past their normal operational limits to deliver the most acceleration possible. In fact, you get a pop-up warning that you have to acknowledge before proceeding. Agree to be on board with the lunacy, and the P100D will then raise the battery pack’s temperature to 122 degrees so it can fly forward from 0 to 60 in 2.9 seconds. For a car that looks so alien out in the wild, it’s pretty satisfying that your SUV wields the power to leave any wannabe street racers in the dust. This is all under the assumption that you’re doing the driving, of course. 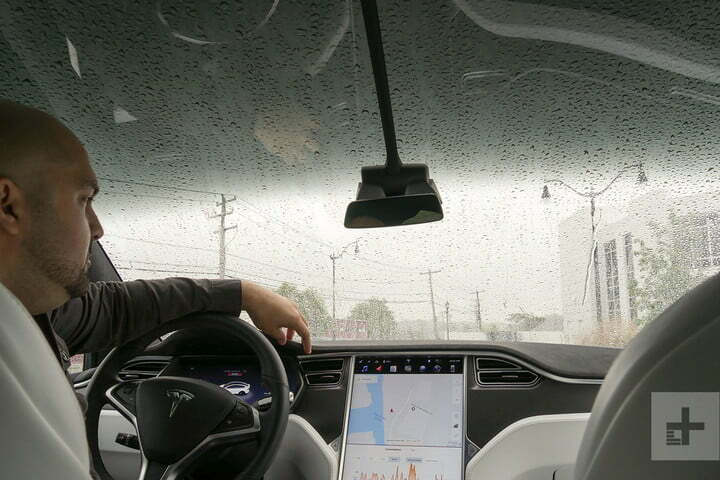 Tesla’s much-lauded Autopilot is an optional extra that showcases more of that thoughtful engineering Tesla is known for. Surrounded by sensors and cameras, the Model X works them all in tandem, allowing for some sophisticated assisted driving. We put this into practice a few times, which included a seemingly endless stretch of rush hour traffic on the Brooklyn-Queens expressway in New York. Rush hour on this highway is like living through the worst thing you’ve ever experienced over and over again for three hours straight. Autopilot isn’t autonomous driving. It’s more like a spiffed-up cruise control that works really, really well. In perfect conditions, Autopilot will extend its perception and monitor the car ahead, keep an eye on the lanes, and adjust accordingly. If you happen to escape gridlock, the Model X can operate in Autopilot at up to 90 mph and has the ability to change lanes automatically with just a flick of the stalk. The promise of 289 miles of range should reduce any fears of range anxiety. It isn’t dissimilar to Volvo’s Pilot Assist on the S90 sedan, but it just works better. In fact, now on its eighth version, Autopilot is incredibly smooth. There’s no bouncing from one end of a lane to the other or any abrupt braking and acceleration — unless you get cut off. It’s easy to see how people can be quick to trust it, but you’ll need to stay involved. This isn’t a self-driving car yet. The frequent alerts to hold the wheel and pay attention make it clear that your involvement is still very much needed. When its done helping you drive, the Model X can help you park just as easily. Automatic parallel parking systems aren’t anything new, but how Tesla implements it caught us by surprise. Usually, you need to preemptively activate automatic parallel parking through a menu, and if you get lucky and the car recognizes the spot, you control the speed while it steers. It takes ages, and has become a barely-used gimmick. When we passed by a free spot and started the act of parking, the Model X — without prompting — offered to take over. When you’re done driving, put it in park, and you can just … leave. The car will lock up and switch off on its own. The promise of 289 miles of range should reduce any fears of range anxiety, particularly if you’re lucky enough to live in an area that has a decent charge station infrastructure, and if your home is well equipped for speedy charge-ups. Unfortunately, I had neither at my disposal. Being a Tesla borrower and only pretending to be an owner, the very old house that I live in had a hard time keeping the amperage up to give the Model X what it needed. When it did work, my meager 110V socket drip-fed the Model X two miles of range for an hour of charge. This is where charge anxiety gripped me each night. I kept monitoring the status through the app to make sure I was getting at least a handful of miles. It stands to reason that owners of a car that starts at upwards of $80,000 are doing well enough that they’ve got a home with a garage and the means to equip it with a 240V wall connector, which will give the Model X 200 miles of range over the course of a six-hour charge. They’ll need to if they want to drive every day. Still, it make me wonder how the lower-priced Model 3 will fare when it opens up Tesla ownership to a different type of customer. It’s the same musings I had during our Chevrolet Bolt review. Though I didn’t travel too far outside of my normal needs, I was ultimately spending more than what I was gaining, and ventured out to one of two Tesla superchargers in range, which could give me 200 miles of range for just a half hour’s worth of charge. This turned out to be an interesting turn of events as it gave me further insight into the life of an average Tesla owner. The charging station happened to be at a Tesla service station and didn’t have much nearby, but there was a lounge to hang out in while the Model X drank up some much-needed juice. While there, I witnessed parts of Tesla owner’s routines: some were just passing by and topping up while others clearly made a habit of coming on lunch breaks. With no engine in the front, the Model X has a pretty deep crumple zone, which is helpful if you’re in trouble. Couple that with a good 5,000 pounds-worth of batteries, and you’re still in the clear in case of a side impact. Like its little big brother, the Model S, the Model X has been crash tested by the National Highway Traffic Safety Administration, which awarded it a five-star safety rating in every category and sub-category, making it the first SUV ever to earn the five-star rating across the board. Hopefully, the myriad sensors and alerts will keep a collision from happening to begin with. The active collision avoidance systems and auto emergency braking functionality has been added in recent over-the-air-updates. While driving, the digital gauge displays a real time graphic of what the car’s sensors detect, essentially showing you what the car can see. You see when a Model X will recognize a car in the distance, if there’s a lane it needs to monitor, or if something passes by. At high and low speeds, this extension of perception is incredibly handy. It’s an odd problem because of how spacious the windshield is, but using the small rearview mirror through the equally tiny rear windshield was difficult at the best of times, and impossible at night. When not using navigation, I tended to keep the backup camera on indefinitely as a supplement. If we’re going in on Tesla, we’re going in all the way. First off, passing up on the P100D would trigger some intense FOMO. The pearl white color of our tester made it really stand out, particularly when paired with the 22-inch onyx black wheels. Having Autopilot included is also a must, at the very least just to have a full compliment of the available gadgetry. Sure, the more than $160K price tag on our Tesla Model X review unit is steep, but it meant a well equipped car. Tesla thought of everything on the Model X. 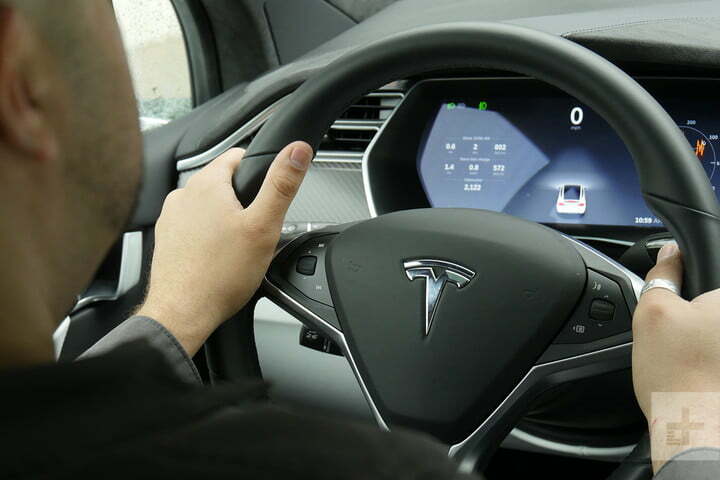 The unconventional approach to car making by Tesla had us thinking “why hasn’t automaker XYZ thought of this?” when it came to features like over-the-air updates, a large touchscreen, and automatic everything. The Model X looks and behaves like a car from the future, but it’s very much a car from the present: We’ve seen all its tricks before. Things like adaptive cruise control, lane-keep assist, automatic opening, proximity-triggered functions and even wacky falcon-wing doors. Unique to Tesla is how it brings all these functions together in the Model X and turns them from gimmicks into functionality. Like a good Apple product, it takes existing tech and implements it better than almost anyone else. Tesla’s sci-fi people mover does run headlong into hefty competition, not the least of which is the Audi Q7. Fully loaded, the Q7 still comes in under the Model X base price at $72,000. Audi will give Tesla more than a few headaches. It’s made incredible advances in autonomous driving and masterfully executes an array of technology on top of a capable on-road/off-road driving platform. If you’d still like to make a splashy entrance (and you enjoy spending money) the Mercedes-AMG GLS63 takes S-Class luxury and stretches out into a $126,880 SUV saddled with a 577-horsepower biturbo V8 that gives the hefty Mercedes a 0 to 60 time of 4.5 seconds. You’ll still need to visit the gas station with these, however. As mentioned, the Model X has the best NHTSA crash test rating anyone could hope for. Tesla offers a 4-year 50,000-mile limited warranty and an 8-year unlimited mile battery and drive unit warranty. Thanks to frequent over-the-air updates, Teslas tend to stay up to date for some time, an even older vehicles — including the 2008 Roadster — have had hardware updates offered to keep them zipping along. Yes. If you need a car, have the money to buy it, and the means to outfit your home with a stage 2 (240V) charging station, the Model X is a must. The convenience offered by its host of tech is unparalleled by current vehicles and will cause even the most cynical driver to re-think their notion of daily driving. Though pricey, staying away from the pump softens the blow, particularly if you’ve equipped your house with solar roofing. You might even consider going all in and upgrading to Teslas own low-profile panels once they become available.